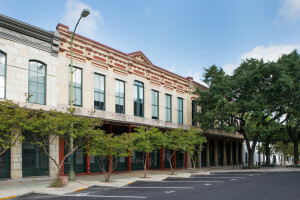 Austin, Texas — Preservation Texas, Inc. has announced that the rehabilitation of the Plaza de Armas Buildings in San Antonio, Texas will receive a 2016 Honor Award for Rehabilitation on February 18, 2016. The Honor Award will be presented at a special ceremony at the historic State Theatre on Congress Avenue in Austin as part of the Preservation Texas 2016 Summit. Located on Military Plaza, the Plaza de Armas Buildings are a set of four structures built in the late 19th century but combined into one office complex in 1979. The City of San Antonio purchased the buildings in 1987. The goal of the award-winning rehabilitation project was to renovate the buildings to house the Offices of Cultural Affairs and Communications and Public Affairs. While the exterior remained largely unchanged, a modern, unsympathetic addition at the rear of the building was removed, a new roof was installed and masonry was repointed. Inside, city offices were created on the second floor with retail, television studios and a multipurpose spaces at street level. Masonry party walls and wood floor joists were left exposed on the interior wherever possible to highlight the historic construction technology of the building. Ford, Powell & Carson Architects and Planners, Inc. were architects for this City of San Antonio-owned project.